Friday  After joining the coach from your taxis, we journey north and cross the boarder into Scotland to reach Drymen and our hotel for the next 6 nights with comfort stops on the way. Saturday  We begin our tour today with a visit to the famous Falkirk Wheel, a magnificent mechanical marvel which has been constructed to 20th century state-of-the-art engineering. We include a 50 minute journey on the boatlift up to the Union Canal for a short cruise before returning to the visitors centre. We continue with a visit to the iconic Kelpies the largest equine sculpture in the world at the Helix centre. Free time to browse the visitors centre and marvel at these wonderful sculptures. 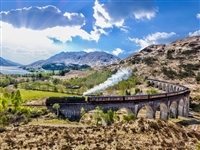 We then travel to the Boness and Kinnel Railway, to take a step back in time to experience a ten-mile scenic return train journey along the Forth Estuary, through woodlands, past waterfalls and over the Avon Viaduct by steam, on this award-winning heritage railway. From our especially reserved dinning car, we are including a full afternoon tea to enhance the whole nostalgic experience. Sunday  Today we visit Stirling Castle, one of the largest and important castles in Scotland, both architecturally and historically. We include entry to explore its impressive rooms at your own pace. This afternoon we take you back in time once again to the Battle of Bannockburn as we visit the thrilling Bannockburn Experience. Each visit takes you through a 3D interpretation of characters and events as you prepare for battle and culminates in a visit to the battle room where you can either take part with other visitors or watch as it plays out! Monday  A morning visit to Aberfoyle followed by a scenic drive over Dukes Pass in the Trossachs. We will enjoy a cruise on Loch Katrine followed by a delicious lunch in the lochside restaurant. Tuesday  Today is a free day for you to relax and enjoy Drymen or you may wish to visit the award-winning complex Loch Lomond Shores, a short bus ride from outside our hotel. Wednesday  A scenic drive around the Trossachs to catch a last glimpse of those Autumn colours before a lunch of soup and sandwiches back at our hotel. This afternoon we will be taking those who wish to join us for whisky tasting on a guided tour around the Glengoyne distillery. Thursday  We say goodbye to our hotel, but before leaving Scotland we stop at Moffat for those last-minute souvenirs and bargains! We will have regular comfort stops on-route and head back to Wiltshire to our awaiting taxis. A modernised 17th century Inn, this family run hotel stands in the pretty village of Drymen. With its log fires, cosy lounges and high standard of cuisine, the Winnock is full of warmth and charm. All rooms are en-suite with TV and hospitality tray.